In an effort to increase the safety of operating complicated aircraft, computers and computer systems have been incorporated. Flight instrumentation and engine and airframe monitoring are areas particularly well suited to gain advantages from the use of computers. They contribute by helping to reduce instrument panel clutter and focusing the pilot’s attention only on matters of imminent importance. “Glass cockpit” is a term that refers to the use of flat-panel display screens in cockpit instrumentation. In reality, it also refers to the use of computer-produced images that have replaced individual mechanical gauges. Moreover, computers and computer systems monitor the processes and components of an operating aircraft beyond human ability while relieving the pilot of the stress from having to do so. 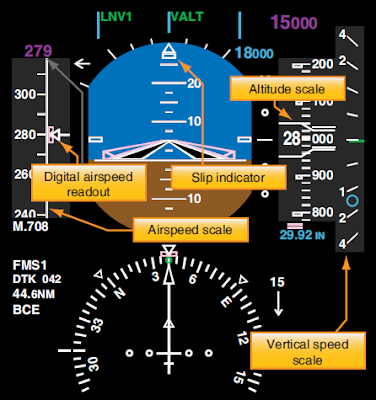 Computerized electronic flight instrument systems have additional benefits. The solid-state nature of the components increases reliability. Also, microprocessors, data buses, and LCDs all save space and weight. 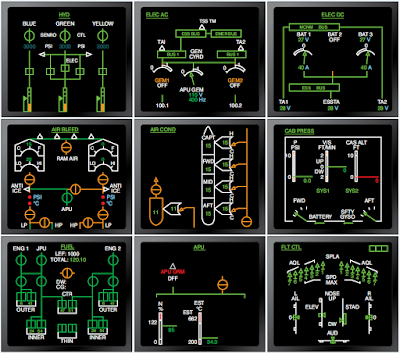 The following systems have been developed and utilized on aircraft for a number of years. New systems and computer architecture are sure to come in the future. The flight instruments were the first to adopt computer technology and utilize flat screen, multifunctional displays (MFD). 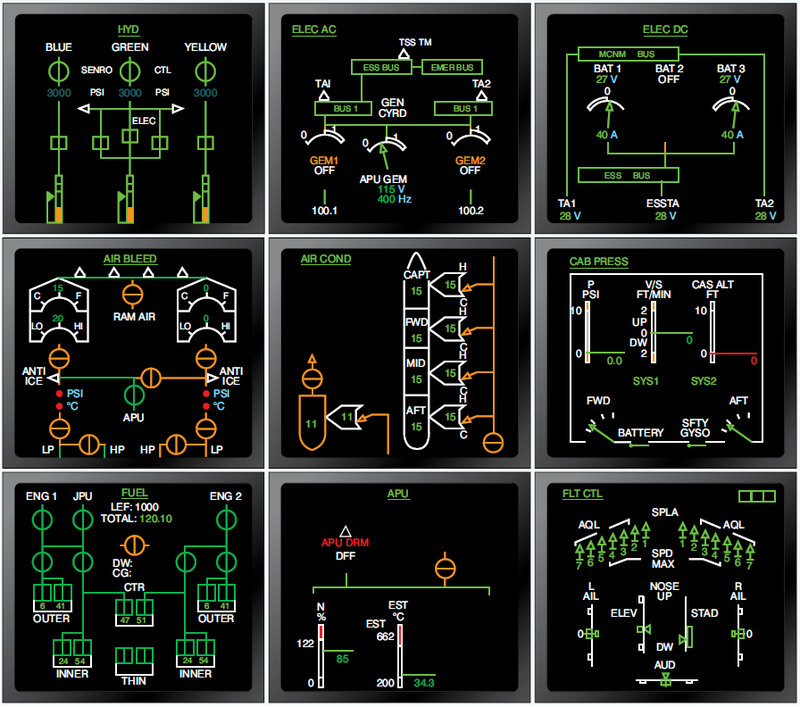 EFIS uses dedicated signal generators to drive two independent displays in the center of the basic T. The attitude indicator and directional gyro are replaced by cathode ray tubes (CRT) used to display EADI and EHSI presentations. These enhanced instruments operate alongside ordinary mechanic and electric instruments with limited integration. Still, EADI and EHSI technology is very desirable, reducing workload and panel scan with the added safety provided by integration of navigation information as described. The pilot’s workload on all aircraft includes continuous monitoring of the flight instruments and the sky outside of the aircraft. It also includes vigilant scrutiny for proper operation of the engine and airframe systems. On transport category aircraft, this can mean monitoring numerous gauges in addition to maneuvering the aircraft. The electronic centralized aircraft monitoring (ECAM) system is designed to assist with this duty. 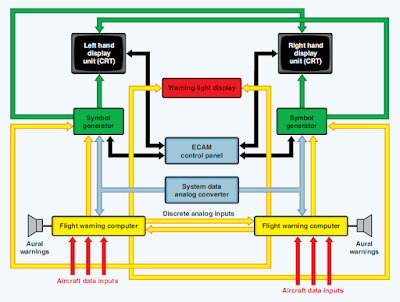 The basic concept behind ECAM (and other monitoring systems) is automatic performance of monitoring duties for the pilot. When a problem is detected or a failure occurs, the primary display, along with an aural and visual cue, alerts the pilot. Corrective action that needs to be taken is displayed, as well as suggested action due to the failure. By performing system monitoring automatically, the pilot is free to fly the aircraft until a problem occurs. Early ECAM systems only monitor airframe systems. Engine parameters are displayed on traditional full-time cockpit gauges. Later model ECAM systems incorporate engine displays, as well as airframe. An ECAM system has two CRT monitors. In newer aircraft, these may be LCD. The left or upper monitor, depending on the aircraft panel layout, displays information on system status and any warnings associated corrective actions. This is done in a checklist format. 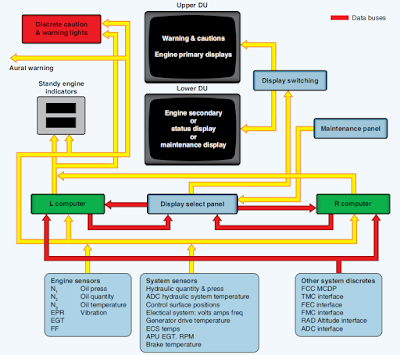 The right or lower monitor displays accompanying system information in a pictorial form, such as a diagram of the system being referred to on the primary monitor. 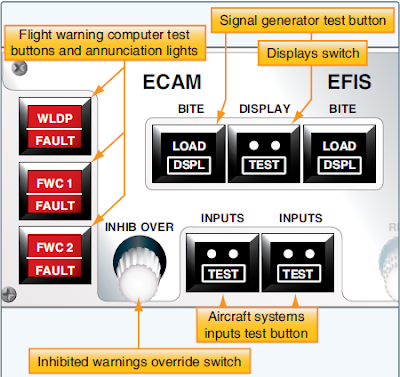 There are four basic modes to the ECAM system: flight phase, advisory, failure related, and manual. The flight phase mode is normally used. The phases are: preflight, takeoff, climb, cruise, descent, approach, and post landing. Advisory and failure–related modes will appear automatically as the situation requires. When an advisory is shown on the primary monitor, the secondary monitor will automatically display the system schematic with numerical values. The same is true for the failure-related mode, which takes precedent over all other modes regardless of which mode is selected at the time of the failure. Color coding is used on the displays to draw attention to matters in order of importance. Display modes are selected via a separate ECAM control panel shown in Figure 4. ECAM flight warning computers self-test upon startup. The signal generators are also tested. A maintenance panel allows for testing annunciation and further testing upon demand. BITE stands for built-in test equipment. 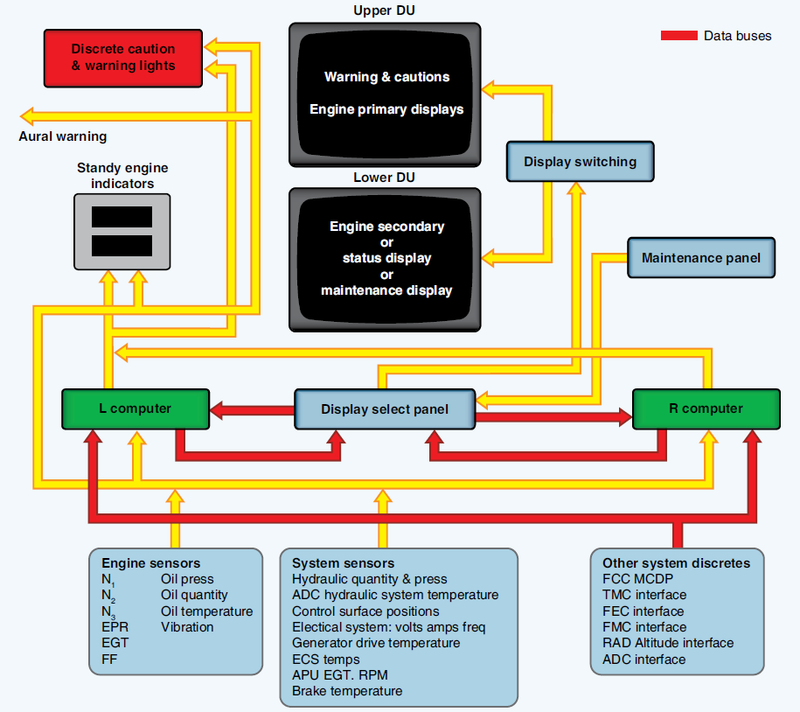 It is standard for monitoring systems to monitor themselves as well as the aircraft systems. 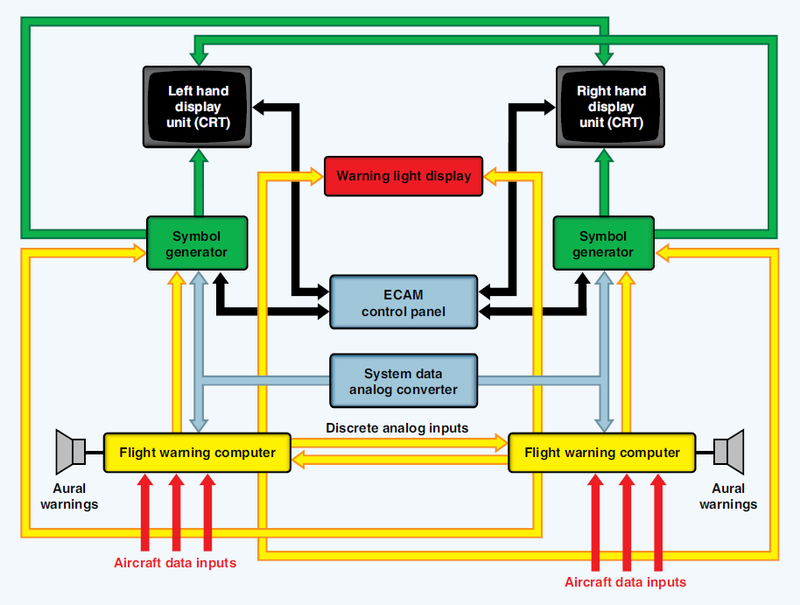 All of the system inputs to the flight warning computers can also be tested for continuity from this panel, as well as inputs and outputs of the system data analog converter. Any individual system faults will be listed on the primary display as normal. Faults in the flight warning computers and signal generators will annunciate on the maintenance panel. [Figure 6] Follow the manufacturer’s guidelines when testing ECAM and related systems. An engine indicating and crew alerting system (EICAS) performs many of the same functions as an ECAM system. The objective is still to monitor the aircraft systems for the pilot. All EICAS display engine, as well as airframe, parameters. Traditional gauges are not utilized, other than a standby combination engine gauge in case of total system failure. 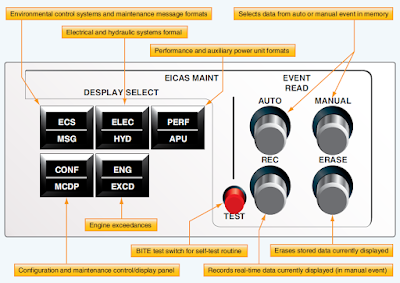 EICAS provides full time primary engine parameters (EPR, N1, EGT) on the top, primary monitor. Advisories and warning are also shown there. Secondary engine parameters and nonengine system status are displayed on the bottom screen. The lower screen is also used for maintenance diagnosis when the aircraft is on the ground. Color coding is used, as well as message prioritizing. The display select panel allows the pilot to choose which computer is actively supplying information. It also controls the display of secondary engine information and system status displays on the lower monitor. EICAS has a unique feature that automatically records the parameters of a failure event to be regarded afterwards by maintenance personnel. Pilots that suspect a problem may be occurring during flight can press the event record button on the display select panel. This also records the parameters for that flight period to be studied later by maintenance. Hydraulic, electrical, environmental, performance, and APU data are examples of what may be recorded.